Here’s my deep thought for the day: apples are great, but pears are divine. I think they go a long way toward making up for the loss of freshly picked strawberries, blueberries, and peaches, which are exiting the stage at this point in the summer. Sure, I’ll miss my summer fruit, but I’m turning my mind to all the goodies in store for me with the hearty fruits of autumn and winter. This salad makes great use of my favorite cooler weather fruit. I’ve featured Bartlett pears with some classic accompaniments: maple syrup, prosciutto, and gorgonzola cheese. The syrup in the dressing adds a subtle sweetness, balancing out the tangy vinegar and salty prosciutto. If you can, I recommend making the dressing in advance. That way the shallots can have time to properly pickle. If you don’t have a chance to make it ahead of time, however, shallots are plenty sweet enough to be enjoyed even when they are raw. A sharp and peppery baby arugula is what this salad wants so look for the freshest stuff you can find. Or, if you prefer, substitute watercress instead. To make the vinaigrette: Place all ingredients in a screw-top jar. Shake to combine. Let the vinaigrette sit to pickle the shallots while you prepare the salad. To make the salad: Slice each pear into 8 wedges. Drizzle the wedges with the lemon juice to prevent browning. Tear the sliced prosciutto into 16 similar sized lengths. Wrap each pear wedge in a piece of prosciutto. 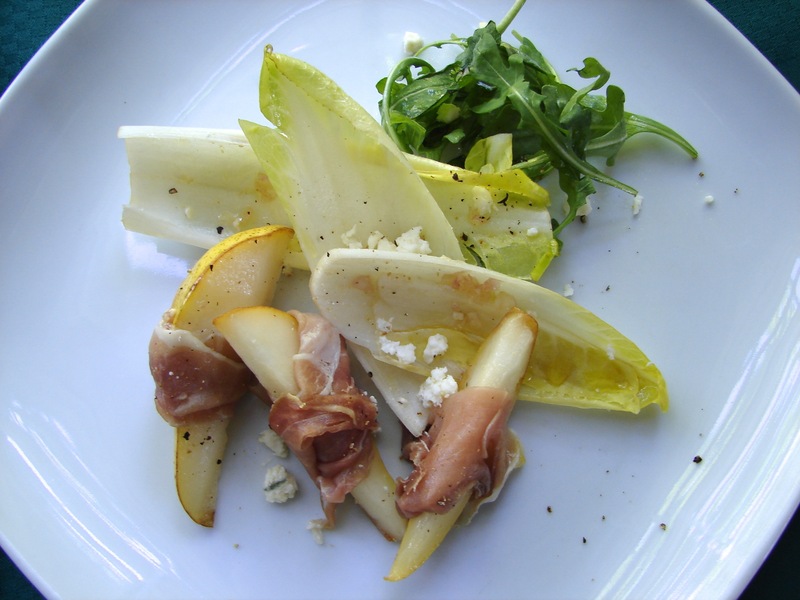 Either on a platter or on individual serving plates, combine the prosciutto-wrapped pears with the arugula and endive. Sprinkle over the cheese and season with salt and pepper. Just before serving, give the vinaigrette jar another shake and drizzle over the salad. Serve immediately. This entry was posted in appetizer, lunch, main, salad, side and tagged dressing, endive, pears, prosciutto, salad. Bookmark the permalink. This looks perfect for a Thanksgiving starter! Maple vinaigrette? Great idea! Thanks!